^ Miller, David, ed (1991). Blackwell Encyclopaedia of Political Thought. en:Blackwell Publishing. ISBN 0-631-17944-5. ^ Ward, Colin. (2004). Anarchism: A Very Short Introduction. Oxford University Press. ^ Ronald Hamowy, Editor, The encyclopedia of libertarianism, p 441. 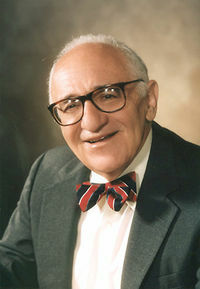 ^ a b Rothbard on War, excerpts from a 1973 Reason Magazine article and other materials, published at Antiwar.com, undated. ^ a b Murray N. Rothbard For a New Liberty, p. 265. ^ a b Roberta Modugno Crocetta, Murray Rothbard's anarcho-capitalism in the contemporary debate. A critical defense, Ludwig Von Mises Institute. ^ Michael Oliver, 'Exclusive Interview With Murray Rothbard, originally published in "The New Banner: A Fortnightly Libertarian Journal", February 25, 1972. ^ David Gordon, Murray N. Rothbard (1926–1995) biography, Ludwig Von Mises Institute. ^ Gary North, Ron Paul on Greenspan’s Fed, Lew Rockwell.com, February 28, 2004. ^ Murray N. Rothbard, The Transformation of the American Right, first published in Continuum, Summer 1964, pp. 220–231; reprinted at LewRockwell.com. ^ George C. Leef, Book Review of Egalitarianism as a Revolt Against Nature and Other Essays by Murray Rothbard, edited by David Gordon (2000 edition), en:The Freeman, July 2001.